The North Rhine Sheep Group has been in operation for at least 15 years. 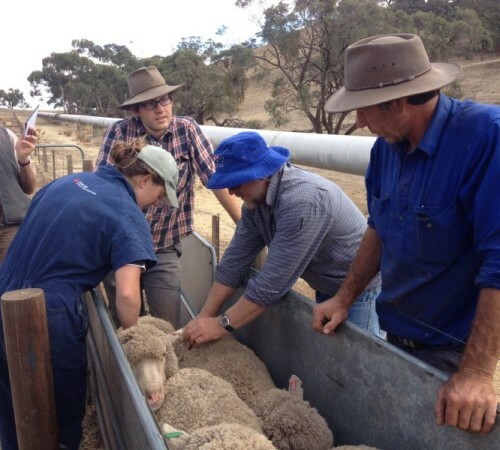 It began as the North Rhine Landcare Group and over time has evolved to become a loose knit group of 10 producers with a focus predominantly on sheep production with a strong NRM focus. Members range from Eden Valley, through Keyneton to Moculta and Koonunga. Lambs Alive is designed to give producers the knowledge and skills to better manage lambing with the primary aim of improving lamb survival by optimising whole farm resource allocation. This requires specific attention to management between total flock scanning and lamb marking, with a major focus given to preparing the ewes and their lambing paddocks to enable better paddock allocation for lambing. The program is delivered on demonstration farms so participants can follow the best management practice in a practical hands-on way. The combination of ‘One-on-One’ coaching and workshop sessions is deemed to be the best mix of delivery methodologies. Good record keeping is required to underpin the success of the program. The group are currently in the second year of this program which upskills producers in the form of condition scoring and pasture measurement and then marrying this data together to develop a feed budget related to the ewe’s nutritional requirements. The second year of the program also includes a component of weaner management. This process allows an analysis of the ewes requirements over time and allow a great opportunity to compare the different local systems over time. One of the members in the group runs the focus farm for this project with other ‘satellite’ sites based on other group members properties. Further Information on this project can be found on the Sheep Connect Area. Property Planning Workshop- develop a whole property plan taking into account land capability, production and ease of management.